It has been quite a while since I've experienced something that for an hour and fifty minutes, completely engulfed me. Love, passion, sexuality, internal conflicts, and pure obsession were just some of the elements that riveted through the screen with every frame. There is no way that my words could do the emotion and spectacular cinematography of this movie justice. In fact, I feel like calling it just a movie is almost like committing a crime. So many of the formulaic films that get put out today are all about explosions, effects and instant gratification with predictable conclusive endings. 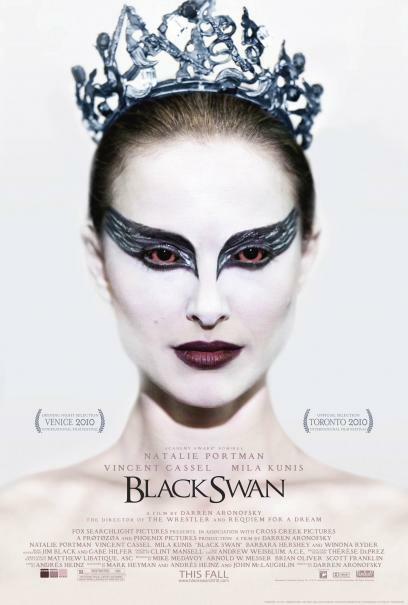 Without spoiling the film for anyone, I can say that Black Swan is incredibly visceral, raw and watching it in an indie small theater, had me reminiscing of the many nights spent in college analyzing films and discussing camera angles and director intent. oh the days. The storyline for Black Swan could have gone wrong in so many ways, shall I do the horrible thing and make the parallel to the tacky 1995 movie "Showgirls" with our favorite gal Jesse from "Saved by the Bell.? I mean the both carry a similar plot, girl is a nobody, struggles to become a grand dancer, old famous girl goes to hospital, new up and comer (main character) gets a shot at the light and then has a revealing moment where the top isn't so grand. I mean in both movies, both of the original famous dancers lose their throne to an accident (I can't be that old and into bad movies that i'm the only one that remembers and sees this). The similarities are striking, yet great film-making makes it entirely different. Truly Natalie Portman's performance, paired with an amazing OST and Rodarte's artistically genius costume designs had me leaving the theater feeling inspired, messed up and agonizingly yearning for life all at the same time. The movie broke into my cerebrum, that has been programmed with years of traffic, commercial radio and cubicles, to remember what passion is all about and how invigorating it is to want or love something so much, that you'd gladly bleed for it. If you end up hate it, don't worry there's always Tron, The Tourist, Harry Potter or re-runs of The Office to re-entertain you and mush your head.